Retail giant Target Corp. (TGT - Get Report) is consolidating a bear market decline, which is a challenge as it offers quarterly earnings before the open on Tuesday, March 5. Target is having a strong start in 2019 with a year-to-date gain of 10.4% and is in bull market territory 21.3% above its Dec. 24 low of $60.15. The stock was in a strong bull market run-up in 2018 that abruptly ended on Sept. 10 when it set its all-time intraday high of $90.39. From this high, the stock plunged to its Christmas Eve low of $60.15, which was a quick bear market decline of 33%. The earnings problem is that Target has missed earnings-per-share estimates in three of its last four reports. On Nov. 20, when the retailer missed estimates, the stock gapped lower from $77.75 on Nov. 19 to its open of $67.99, down 12.5%. Analysts expect the big box retailer to report earnings of $1.53 per share when it reports Tuesday pre-market. Wall Street bulls are touting Target's new brands, remodeled stores and its strategy to offer same-day delivery options. Target, after warning on Nov. 20, reported solid same-store sales during its 2018 holiday season. However, the stock remains well below its Nov. 19 low of $77.56. Fundamentally, Target is reasonably priced with a P/E ratio of 13.75 and a dividend yield of 3.54%, according to Macrotrends. The daily chart for Target clearly shows the bear market decline of 33% from the Sept. 10 high of $90.39 to the Christmas Eve low of $60.15. Note the huge price gap lower that followed the earnings report released on Nov. 20. The stock closed at $66.09 on Dec. 31, which was an important input to my proprietary analytics. 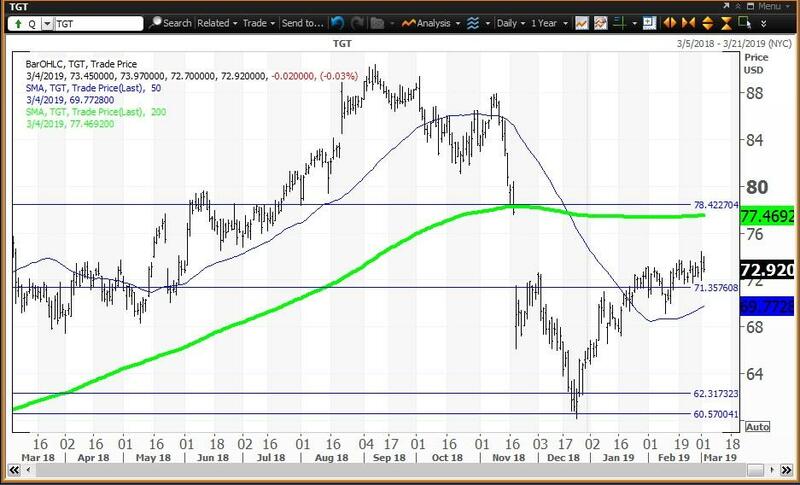 Most important is my annual pivot at $71.39, which was a magnet between Jan. 23 and Feb. 14 and is a key level to hold on earnings weakness. Below are my semiannual and quarterly value levels at $62.34 and $60.59. The close of $72.74 on Feb. 28 resulted in my risky level for March at $78.40. A positive reaction to earnings should result in filling the price gap to the Nov. 19 low of $77.56 as the upside is to the 200-day simple moving average of $77.47 and my monthly risky level of $78.40. The weekly chart for Target is positive with the stock above its five-week modified moving average of $71.95. The stock is also above its 200-week simple moving average of "reversion to the mean" of $70.92. The 12x3x3 weekly slow stochastic reading is projected to rise to 75.57 this week up from 68.32 on March 1. Note that at the high, the stochastic reading was above 90.00 as an "inflating parabolic bubble". This indicated that investors should have reduced holdings. 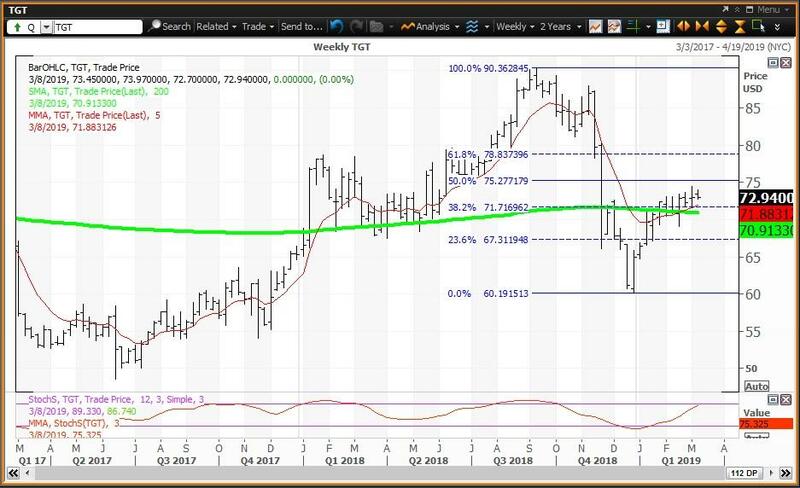 The horizontal lines are the Fibonacci Retracement levels of the 33% decline from the Sept. 2018 high of $90.39 to the low of $60.15 on Christmas Eve. The stock is between its 38.2% retracement of $71.72 and its 50% retracement at $75.28. Trading Strategy: Buy weakness to my annual pivot at $71.39 and reduce holdings on strength to my monthly risky level at $78.40. If the stock gaps below $71.39, the downside risk is to my semiannual and quarterly value levels at $62.34 and $60.59, respectively.